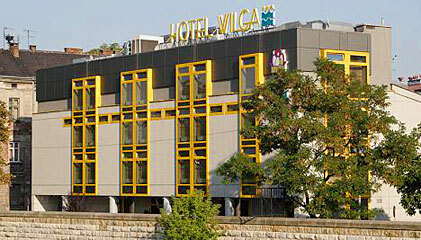 Welcome to the three star WILGA Hotel***. Modern facilities are designed to host individual and business Guests as well as tourist groups. A special rebate package is available for regular Guests. 35 comfortable single, double 3- and 4-bed rooms, all with bathrooms en suite, TV Sat, radio, telephone and free access to the Internet. Suite with mini-bar also available. We have rooms with facilities for disabled persons. The hotel's parking lot is monitored. Buffet breakfast, excellent, traditional Old Polish lunches and dinners, vines from all over the world simply delicious! The restaurant room is air conditioned. /Conference rooms and their facilities shall certainly meet your requirements. The personnel is ready to arrange almost any conference. We have 4 rooms for 80 participants. Our personnel will be happy to organise your visit to Cracow, with maximum comfort and entertainment for you. The hotel is ready to arrange trips, book tickets, order taxis and suggest sightseeing attractions.